Slough Jets skated onto home ice for the penultimate time in the regular season to take on Telford Tigers knowing nothing less than a win would keep the play-off dream alive. Both teams settled down quickly, the visitors getting the better of the opening shot exchanges but Slough’s shooters forcing some good defence and netmending but with 16.16 gone Marek Makusovic put the visitors ahead with the game’s opening goal and the first period ended with the score still 0-1. Despite being outshot again in the second period it was the home team who dominated the period and starting it a goal behind a perfect period saw them end it a goal ahead. Ales Padelek scored the first goal of the period at 20.30 and Mindy Kieras came up with the go-ahead goal at 30.29. Telford couldn’t break the period shut-out and the second period closed 2-1. Slough had a great start to the final period but against the run of play Joe Miller levelled up at 44.48 and then scored the game winning goal at 48.41. The visitors took advantage of Slough’s opening up in search of the necessary game tying goal by flattering their winning margin thanks to Michal Pavlu scoring at 50.08 and Nathan Salem at 52.33. Slough got the first leg of the Premier Cup Final with their opponents electing to take the second and final leg at the Spectrum. Guildford conceded the game’s first penalty and killed it off but when Slough conceded their first penalty at 7.02 and Mindy Kieras served a tripping penalty, while the defenceman sat out Guildford score on the man advantage, Milos Melicherik scoring a powerplay goal at 8.01. Michael Wales was next to be penalised and Guildford converted that powerplay as well when Curtis Huppe scored at 10.45. Slough pulled a goal back at 11.42 when Darius Pliskauskas found a way past Mark Lee with an excellent goal but 58 seconds later Melicherik scored his second to make it 1-3 with the visitors first even strength goal. Back on the powerplay Curtis Huppe netted a second at 17.07 to end the first period 1-4. Slough pressured their opponents hard in the third period but the visiting netminder was in top form denying any further scoring and the third period and first leg ended at 2-4 giving Guildford a two goal lead to start the second leg. Darius Pliskauskas netted a powerplay opener at 7.14 to put the home team ahead but James Ferrara’s powerplay shot trickled through into the back of the net at 9.23 to level the game. Both netminders shut up shop and denied all the remaining attempts in the period leaving the first period drawn at 1-1. Frantisek Bakrlik netted the game winning goal at 25.13 with an unassisted strike leaving Damian King no chance of the save and despite the visitors holding the shot advantage through the remainder of the period it ended 1-0 and Slough took the second interval in the league. The third period was a display of clinical hockey for the home team with defence and netminding seeing their visitors unable to score and force the game past regulation. Slough Jets waited to face Swindon Wildcats with the away team delayed in the traffic delay from an earlier motorway incident the game eventually faced-off 67 minutes after schedule. Slough got off to a great start when Darius Pliskauskas netted at 2.00 from Dan Davies but 8.44 later it was 1-1 thanks to an Aaron Nell goal for the visitors and from the 23 shots in total in the period the teams shared the spoils at 1-1. The second period saw the visitors step up and blast 22 shots on Gregg Rockman in the home team net and at 28.03 Nicky Watt put Swindon ahead with a powerplay goal. 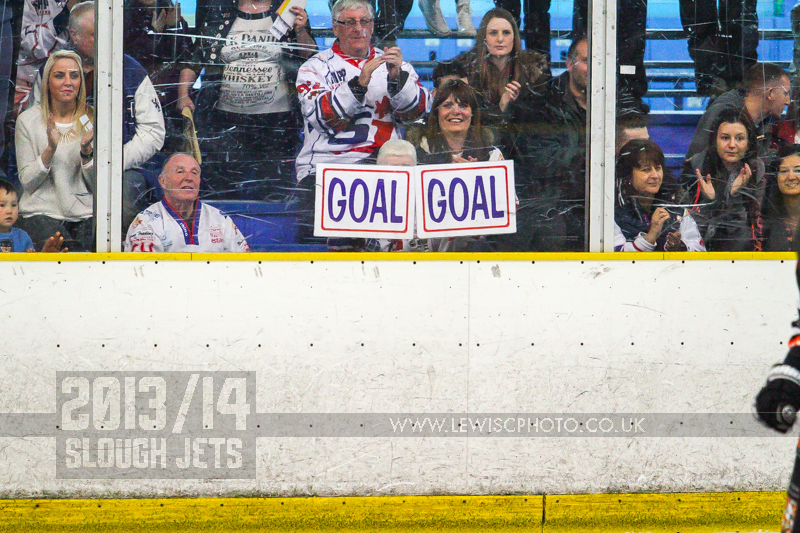 At 33.58 Aaron Nell recorded Swindon’s third goal while the visitors kept the home team off the board in the period. The third period saw the shots swap to the other end with Slough sending 21 shots in on Thomas Murdy in the Swindon net while Rockman faced just 5. Murdy dealt confidently with every shot until at 56.34 Mindy Kieras scored an unassisted goal to make it 2-3. Slough called their time-out at 58.13 and when Michael Pinc picked up a penalty at 58.45 pulled Rockman for the extra attacker but at 59.49 Swindon scored shorthaned into the empty net to make it 2-4. Slough travelled to Manchester for the rescheduled match from the snow postponement before Christmas. Adam Calder picked up the game’s first penalty at 4.00 and 65 seconds later Ben Morgan scored to gain a lead for the home team. The lead was short lived as Darius Pliskauskas netted at 6.04 to make it 1-1 before the teams settled down. It was at the other end of the period that Ryan Watt put the visitors in the lead at 17.04 but 38 seconds later Tony Hand scored to level and the first period ended tied at 2. The home team enjoyed a successful period as they ended ahead thanks to goals from Morgan (33.46) and Curtis Huppe (38.17) but a shorthanded goal from Shaun Thompson at 37.08 kept Slough in the game. The third period belonged to Slough as they came back into the game and finished two goals clear. Adam Calder netted at 48.40 to level up at 4-4 and Pliskauskas netted a second at 53.48. The home team opted for an empty net and extra attacker to try and pull back but Aaron Connolly found the back of the empty net with 3 seconds left in the game to seal the victory. Slough’s weekend started with their final time of the season hosting the Basingstoke Bison. Both teams seemed keen to lay out their systems early in the game but it was a penalty that gave the winning team their first advantange. Sam Waller took an interference penalty at 8.39 and was joined by Adam Greener called for hooking at 10.40. Slough killed the first penalty successfully but Mindy Kieras scored at 11.34 just 6 seconds before the second penalty ended for a 0-1 lead. Slough outshot their opponents in the third period and eventually Blaz Emersic got them on the board at 48.30. Continuing to push hard for a comeback Slough called a time-out with 3.47 remaining but before they could make any changes to their on ice personnel Tom Long scored the visitors fourth with 3.05 remaining wrapping up their win.